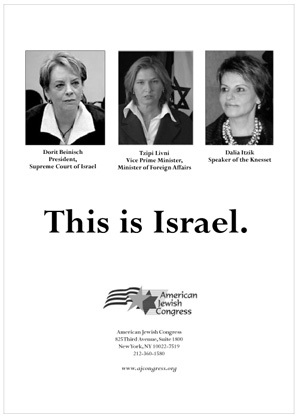 Pro-femme magazine Ms. recently got a spanking in the Jewish community for rejecting the ad at left. 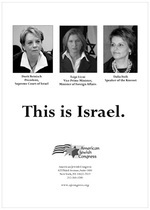 It features images of three Israeli women in power: president Dorit Beinisch of Israel's Supreme Court, foreign minister Tzipi Livni, and speaker Dalia Itzik, above the words, "This is Israel." 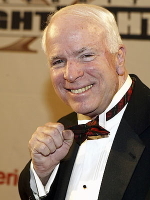 The American Jewish Congress -- which submitted the ad -- said Ms. first approved it, then rejected it at the last minute under grounds it would "set off a firestorm," which, as often happens, it did anyway. In response, Ms. pointed out Tzipi Livni's career and accomplishments are profiled in its current issue.